A sign on the drillfield provides visitors with additional information about the April 16th Memorial, including background details and guidelines for leaving memorial items. Photo taken February 14, 2008. 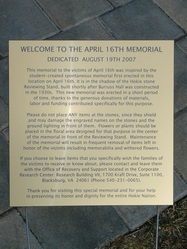 Brent Jesiek, “Welcome to the April 16th Memorial,” The April 16 Archive, accessed April 19, 2019, http://april16archive.org/items/show/1797.